What do you look for when you sit down to eat a meal at leisure? Is it the quality of the food, the taste, the ambience (if it’s not at home), the service that you get or is it everything put together? Similarly what does one look for in a movie these days? Is it the plot, the writing, the performance of the actors, the presence of known names, the music, the camerawork and other technical details or is it everything put together? Now what would be your reaction if you got to enjoy a wholesome meal with all the right ingredients and under the right ambience and got the best of the service? Similarly what would be your reaction if you got to watch a movie that has everything that you are looking forward to? Confused? 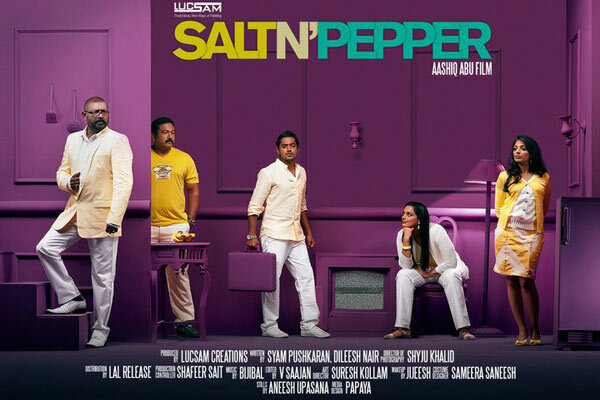 Well please don’t be because there are the kind of questions that are going on in my mind ever since I watched director Aashiq Abu’s ‘Salt N’Pepper’, a Malayalam movie making waves both inside & outside Kerala and warming the hearts of its audience. On the surface of it the movie is not revolutionary in terms of the story, nor does it boast of any super star and neither is the director’s track record envious (his 1st and previous film with Mammootty, Daddy Cool didn’t do well commercially). But scratch the surface and you see that there are so many elements that go in favour of the movie. Let’s look into each of these elements a bit more in detail. But before that let’s cast a look at what the movie is all about. Essentially the film is all about how romance plays a role in the life of various people in their life. Kathali Parambil Kalidasan (Lal) is a middle-aged bachelor who works for the State Archeological Department and is a complete foodie. True to his profession he even loves collecting and using antiques at home, to the extent that even his car is a vintage Fiat. Kalidasan has really no regrets about his life and is happy with his ‘Old Monk’ sessions in the evenings accompanied by some wonderful food, often suggested by Kalidasan himself and prepared to his liking by his cook, Babu (Baburaj) who is more or less his man Friday of sorts. In this idyllic sort of set-up in comes Manu Raghavan (Asif Ali), the nephew of Kalidasan who has come from Bengaluru to Thiruvananthapuram in search of a job and hence stays at his uncle’s place. Manu is a compulsive flirt and takes life easy. In a lot of ways he is very different in nature when compared to Kalidasan. But soon Manu fits into the routine at Kalidasan’s place and life is peaceful for the trio of Kalidasan, Manu, Babu (and Moopan the silent tribal who is also present with them). Maya (Shweta Menon) is in her mid 30’s and is unmarried. She is a dubbing artist and a foodie herself. Maya stays as a paying guest along with Meenakshi (Mythili) at Mary’s (Kalpana) house, who also runs a beauty parlour in the same premises. In fact Maya, Meenakshi and Mary also together have a wonderful bonding of their own. One fine day however Kalidasan and Maya’s lives intersect thanks to a wrong phone call. It’s a typical working day and Maya yearns to eat ‘Thattil Kutty Dosa’ and calls up the restaurant to order for the same, only to end up reaching Kalidsan by mistake. Though initially both Kalidasan and Maya have a lot of scorn for each other, they keep talking to each other (egged on by Manu and Meenakshi respectively) and they break the ice when they realize that they do share certain common interests, chiefly food. The friendship over the phone slowly starts assuming the shape of a relationship when Kalidasan lets Maya know the story behind a multi-layered cake called Joan’s Rainbow. As they both meticulously prepare the cake at their respective places, we see their hearts melting just as the cake melts in their mouth. So there then comes a point when both Maya and Kalidasan decide it’s time to meet and explore if there’s anything further to their relationship. But both become self-conscious of their physical appearances and wonder how the other person will react. Hence both of them end up sending younger substitutes- Meenkashi and Manu to go and do the needful on their behalf. This is where chaos sets in, not just in the lives of Maya and Kalidasan, but also in the lives of Meenakshi and Manu. How do the principal characters go through the chaotic phase and do they emerge triumphant in their pursuit of love is what the rest of the tale is all about. The movie which comes with the tag line- “Oru Dosa Undakkiya Katha” (The story created by a Dosa) has our taste buds working overtime in the 1st half of the film. Right at the beginning when the rather innovative opening track (during the opening credits) “Chembavu” sung in rustic fashion by Pushpavathy comes on; one witnesses visuals of some of the most popular eating joints in Kerala. There’s more to come as there are constant visuals of either Maya or Babu cooking something or Kalidasan doling out instructions about some recipe to Babu. Talking about interesting moments in the film, there’s one too many. Some of the standout moments include the portion where Kalidasan and Babu meet for the first time; the situation is extremely funny and innovative and surprisingly has even gay overtones (which kind of remains for a major part of the film but in a very understated and mild-humorous fashion). Also to be noted is the part during New Year’s Eve when it’s not just the men who are celebrating in their way but we also get to see Maya, Meenakshi and Mary welcoming the New Year by celebrating in style on their rooftop- something very natural and hardly seen in Indian films. Also praiseworthy is the scene when Kalidasan, Babu and Manu are enjoying the ‘Thattil Kutty Dosa’ and Babu enthusiastically exclaims ‘Ithivide ondayittu nammal ariyaandu poyallo!’ (in spite of being here we never knew about it)- not only is the reaction spontaneous but also its heartening to see a cook actually relishing the work of another cook. And watch out for the portion when director Aasahiq Abu makes a tongue-in-cheek reference to heroines from outside Kerala being given priority over native Keralites in Malayalam Cinema ( this is done through a brilliant reference to the director’s own previous film- Daddy Cool 🙂 ). Well such are the moments in the film that one can keep writing about it, but I’d rather not spoil the fun for those who are yet to watch the film. The film also boasts of a wonderful music score composed by Bijibal. Apart from the wonderful ‘Chembavu’ (lyrics by Bijibal and Rafeeque Ahamed) in the beginning the other songs include ‘Premikkumbol ‘(sung by P.Jayachandran and Neha Nair, lyrics by Bijibal and Rafeeque Ahamed), a wonderful romantic track that symbolizes the start of something interesting between Kalidasan and Maya. ‘Kaanamullal ‘is another classy romantic track picturised on Meenakshi and Manu and picturised in some wonderful locations captured through the wonderful lens of Shyju Khalid’s camera. And how can one forget the vibrant ‘Aanakallan’, the special music video track by Avial that comes in right at the end of the movie and acts as a wonderful finish to the film. The film would not have been all that memorable if not for the dialogues by Syam Puskaran and Dileesh Nair, which have the desired level of humour and punch. A special word of mention to Suresh Kollam’s art direction (the antiques used in Kalidasan’s bungalow & the warm hues and colours on display at Maya’s abode are a treat to the eye) and costumes by Sameera Saneesh which are a wonderful blend of style and authenticity. In terms of performances Lal is simply wonderful as Kalidasan the archeologist with a passion for antiques and food. So likeable is he in the film that it makes one feel that probably no one else could do so much justice to the role as he does. Shweta Menon as Maya has equal footing as Lal and doesn’t disappoint at all. She’s one actress who has really climbed up the ladder in Malayalam Cinema and has carved a place for herself. This year with films as diverse as City of God, Rathinirvedam, Salt N’Pepper etc, she’s surely on the right track. Also a word of appreciation for Bhagyalakshmi’s whose voice suits Shweta so well in the film. Asif Ali is certainly a good prospect among the current set of young actors in Malayalam Cinema and here again he makes good opportunity of the platform provided. Mythili has a good role but looks a bit out of place in most of her scenes. Vijayaraghavan as the senior colleague of Lal with his own romantic story is wonderful and so is the newcomer Ahmed Sidhique as K.T.Mirash, the ‘adviser/scholar’ friend of Asif Ali in the film. But the real surprise in the film is Baburaj, the perennial villain of Malayalam Cinema who steals the thunder with his remarkable performance as Babu the cook. Kalpana has nothing much to do while Dileesh Pothen as the director with a crush on Shweta Menon is hilarious. But for a film that tickles our gastronomical buds and hooks us completely in the 1st half, the 2nd half is a bit of a letdown. There is no connect to food anymore (unfortunately) and the film slowly meanders its way a bit laboriously as it gets a bit melodramatic. Also the Moopan track (with all the so called thrill elements shown) seems to be totally a side-track that’s irrelevant to the story anyways. If these were taken care of the movie probably would have gone to become an instant classic, but in spite of this the film is more than worth a watch. It’s a film that has its heart in the right place and is fun to watch. As the film hurries a bit to the climax, you still walk away with a broad smile as the film ends on an interesting note with a wonderful exchange of dialogues between Shweta and Lal. And for someone who is Mumbai based and always thought of Kerala as a place to go & unwind it was amazing to see that there is a lot of “life” beyond the regular in Kerala. Be it in the form of interesting work profiles of the lead characters (archeology, dubbing for films), life styles followed, a trendy Café Coffee Day and Mythili undertaking IELTS coaching –the movie does make me even re-think of Kerala as a place to live and work in. Go for this feast- I’m sure you’ll find it memorable. Loved the movie. Seriously loved it. But still, I wish the 2nd half would’ve been a little different. Yes Vicramb I share similar feelings about the movie-easily one of the better Indian films to come out this year!!! Ajay I am not sure why the film didn’t appeal to you, to each his/her own.This is not what I call a great film & I’ve agreed with Vikram that the 2nd half could have been a little better.But the film has enough to entertain with its music & a lot of interesting moments. It’s also nice to see the focus on a middle-aged slightly unconventional romance.